I LOVED this book! This is one of those rare books in which the ending is elevated beyond simply satisfying the plot. It brings the reader to an entirely new level of insight with Georges, the main character. I appreciated the depth of development in Georges’ character: his affinity for Georges Seurat’s work (the 19th-century French artist for whom he is named)–especially pointillisme, his determination to look beyond the unpleasant treatment he receives at school at the hands of bullies, his loneliness, his distinct values of honesty and kindness, his technique of watching America’s Funniest Videos to take himself out of a depressed space are all vivid, effective characteristics which give the reader a fully formed impression of who Georges is. Each of these characteristics binds the reader a little closer to Georges as we see shades of our fears in him, each element causing us to willingly invest more of ourselves in Georges and his story. When Georges and his family are forced–due to finances–to sell a house they love and move to an apartment building nearby Georges meets Safer, a boy his own age who also lives in the apartment building with his parents, brother and sister. Georges and Safer–with intermittent interruptions from Safer’s younger sister, Candy–are engaged in “spying” on Mr. X. Mr. X is another resident of the building who Safer claims to have been observing for some time. A man who dresses in black and carries a lot of large suitcases back and forth, Mr. X is the object of their reconnaissance missions and their various suspicions. Events at school with a couple of bullies are also accelerating for Georges. As these come to a head Georges has a breakthrough in his surveillance surrounding Mr. X. This revelation causes Georges to call everything in his life into question. Small lies and huge lies, those that are harmless and those that have the potential to change the course of Georges’ life all come spilling out for the stunned reader. The depth and breadth of the lies others tell Georges and those he tells himself converge for him in a shattering moment. The resolution going forward from this moment is more than satisfying for Georges and for the reader. This book could be an excellent read-aloud–although I will caution parents & teachers that there are 2 brief moments where a mild cuss word is used (personally, I would just skip over it in a read-aloud situation since the absence of the word itself detracts nothing from the story–it’s used in a bully scene and many others can be substituted). 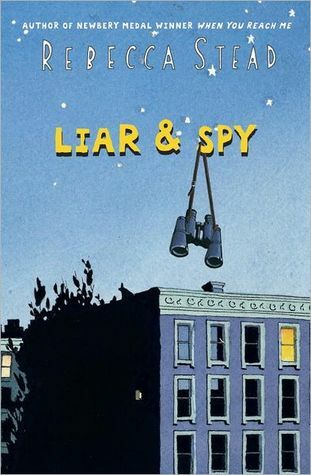 Rebecca Stead’s When You Reach Me won the 2010 Newberry Medal but as far as I’m concerned, Liar & Spy FAR outstrips that work in content and accessibility to its readers. THIS one deserves a Newberry! Thanks for the review!!! I will read it as soon as possible!! Can’t wait for your next post!! Thank you for reviewing inspiring books!